Two roads diverged in a wood, and I— | I took the one less traveled by, | And that has made all the difference. GATE, much like writers who choose to use “The Road Not Taken” as openings to their columns, takes the more-traveled road as a matter of course—yet, in doing so, it makes way for the discovery of a few rare mushrooms along the path and one big one with a bad smell that covers the whole forest. Now, I don’t mean to be coy here; I enjoyed GATE a whole heckuva lot. It’s a fascinating blend of things I found engaging and off-putting, likable and awful. At the end of the day, though, I’ll always give three cheers for a show that manages to succeed in spite of a fundamentally misguided base premise. There’s something awfully human about a show like that—even if you might not want to emulate it. With that said, I don’t think it’s a coincidence that the strongest positive forces in GATE lie not with the JSDF (the Japan Self-Defense Forces, their equivalent to a standing army) as an entity, but in the individual characters who populate the show. 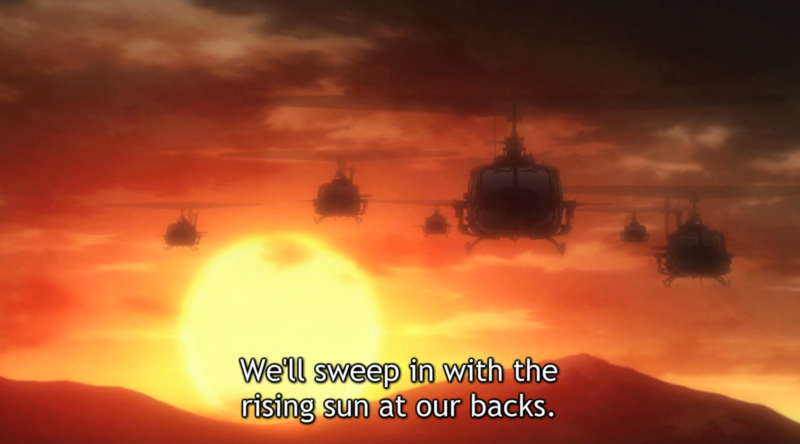 Although the full title of the show reads GATE: And So, the JSDF Fought There, it’s really not the JSDF that matter in the grand scheme of the story, no matter how much the show’s narrative and subtext may try to make you believe it. No, this is a story about the actions of a group of individuals, not about the glorified illusion of a monolithic modern fighting force. Lelei la Lalena, the 15-year-old human mage, is my preferred example of this point, although it certainly applies to Itami, Rory, Piña, and even the recently introduced Yao Ha Ducy. 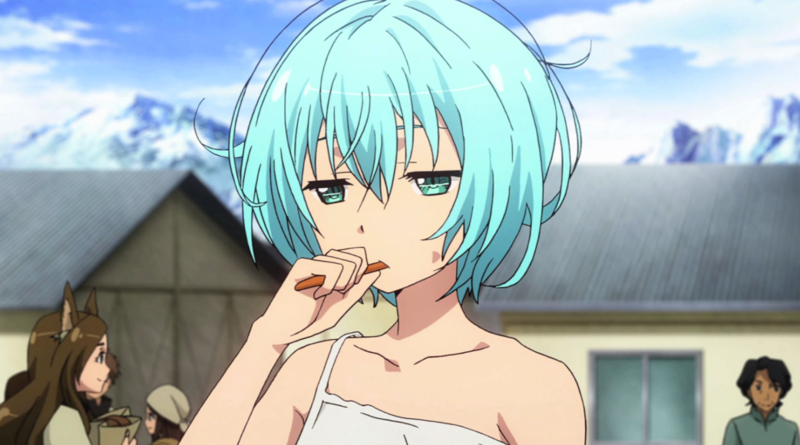 While Lelei was, in terms of aesthetics alone, my favorite character from the get-go, as GATE wore on I found myself surprised by the extent to which Lelei’s behavior was ruled not by the tropes of her character type, but by her fundamental motivating curiosity and interest in learning. Exiled from her home by the Fire Dragon and forced into the camp of her world’s invaders, she neither shrinks nor quivers, but watches with wide-open eyes. She learns. She grows. She becomes not only an active participant in her destiny despite the crazy changes in her life, but also becomes an indispensable source of assistance for the JSDF. In other words, Lelei writes her own story. 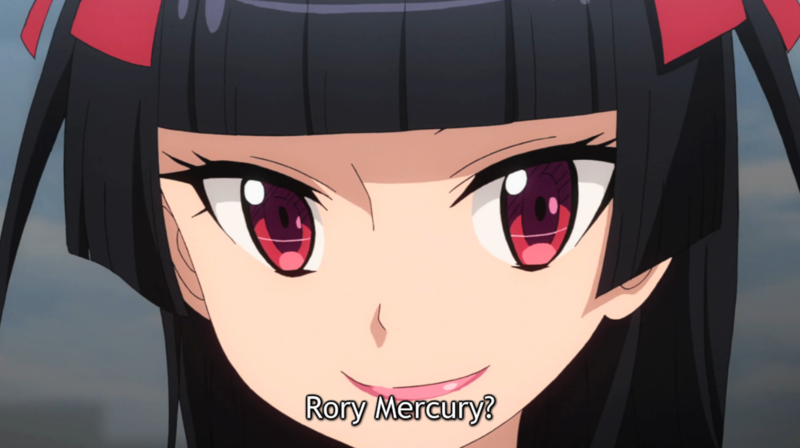 Like Lelei, the more generally popular Rory (yes, I’m aware people love Rory—and I’m not going to tell them they’re wrong) stands as an exceptional example of a character grounded in a familiar archetype(s) and subsequently released to inflict the chaos of her personality onto the world. While Lelei’s “chaos” is perhaps not quite so much that, Rory is almost literally a loose cannon, particularly amidst the JSDF’s tightly ordered military hierarchy and the stiff modernity of our Earth’s reality. I mean, she’s a demigoddess goth-loli priestess for a god of death, war, crime, and madness who carries around a giant axe and is also effectively immortal. And she’s a woman. She’s basically the antithesis of the masculine-oriented, detail-obsessed, control-freak worldview of the military. And yet, she exists. And is awesome. Itami, for his part, plays the token nice-guy-protagonist role easily enough, but as with our previous two examples, there’s more to him than just his assigned position. A slacker, but good-natured and quietly competent, Itami more or less does whatever the heck he wants—whether it’s in the fantasy world or in Japan. By being both good at his job and lazy, he violates the patterns of his established character options. He could either be a total badass, a total slacker, or a hapless nice-guy, but instead he’s kind of all three of them at once—and none of them entirely. And because of that, he seizes the autonomy to operate within the confines of GATE’s narrative world however he sees fit. Elsewhere, the examples are weaker—as in Kuribayashi’s case—or less consistent—as in Piña’s—but they’re still there. And, even better, the majority of these characters are generally likable folk, easy to watch and root for. But those are the rare mushrooms in this mystical forest beyond the gate. There’s still one more, the big, stinky one whose stench hangs over the entirety of our potentially pleasant walk through the world of GATE. I refer, of course, to the persistently obvious imperialistic, militaristic, and nationalistic overtones of the anime. To anyone who’s watched GATE, you know exactly what I’m talking about. Whether it’s “Ride of the Valkyries” being played, first ironically and then not, as the JSDF’s helicopter force flies in to save a helpless town from a pack of violent barbarians or the loving shots of military weaponry or the characterization of all who dare to stand in the way of the JSDF’s benevolent outreach to the primitive world beyond the gate (yeah, I’m talking about you, America, you corrupt country of self-serving politicians, geez), GATEthinks Japan, the JSDF, and blowing up loads of soldiers with explicitly inferior weaponry is awesome. For those of you who didn’t know, the author of the original light novels is a former member of the JSDF, and his bias comes through loud and clear. In fact, I’d argue that GATE on the whole serves as one big pat on the back for the JSDF, a continual celebration of military might, soft-power politics, and the glory of Japan. In the context of modern Japan, GATE’s very nearly horrifying—but as a self-contained object it reads more as endearingly misguided. Its means and methods consistently validate the use of military power (recall the strawman summons before the Diet, the strawman being the angry anti-JSDF lady politician), paint the JSDF as a kindly force despite the fact that they have fundamentally become invaders of the fantasy world enforcing their will on people who have no choice but to comply, and overall batter the audience into a starry-eyed applause any time the JSDF does anything. Frankly, I find GATE’s larger ambitions distrubing—but underneath the cloud of this mushroom’s smell, the bright spots of its characters remain. They are GATE’s saving grace, the autonomous players in this single ending game. In a lot of ways, I find the fact that characters like Lelei, Rory, and Itami exist in GATE almost miraculous. Their fierce individualism feels almost entirely at odds with the brainwashing impulses of their show, and out of that tension comes both an amusing rebuttal of GATE’s main goals—and a whole heckuva a lot of Rory fun. This piece was originally published under the same title on Crunchyroll as part of the Aniwords column. The original post can be found here. I look forward to your more in-depth look into Gate. Something I think I somewhat dance around with but not really tackle head on. Yeah, I’m hoping to get it out on Friday, but I’ve got a pile of other more pressing things ahead of it, so it might get bumped back a week. I am really looking forward to writing it, though, and posts I’m excited about producing tend to be where my best ideas show up. Should be next-last, as there’s a couple of shows that won’t finish till after tomorrow…. Well, those are all going to get folded into the seasonal Final Ratings post. Man… I am very sorry I read the comments on Crunchyroll. Some of CR posters are questinable . But then there are good ones too . I know which ones I could toatally disagree but have a polite concervation ! I am afraid to post sometimes because of backlash ! Seriously some people are pyschotic when it comes to anime ! BTW there was a lot of confusion about the number of episodes for Gate Most people thought it was 24 when eventually it was 12 The problem was a lot of us still had sources (most ) that said 24 and we were linda clled wrong when the sources should have been faulted there was an arrogrant tone set . Like I said most posters were thinking 24 ! The thing is this person wasnt a regular poster until the EP count and most of us were having a good time with the show posts . One person could ruin the tone ! People complain about Funi not having a good forum but I could see why with all the flaming that goes on ! It just gets so nasty on CR a lot more than lately ! I’ve been cursed at / called names / even though I am civil and the mods dont want to rock the boat ! A poster could write a mindlees 2000 word or more post ( more like rant! )but if post a couple of extra pics you get yelled at ! I hope I didnt bore you but it’s a pet peeve of mine ! My understanding is that it will ultimately be 24 eps but it’s split cour. So the second half will air in winter. There was confirmation that the second cour will be aired this January. It’s floating on the Facetubes. I’m going to go ahead and admit that I do not at all see the overriding imperialism/nationalism and glorification of politics/militarism that you see in this series. (Note: I personally HATE politics and militarism and have extreme doubts about whether nationalism can really be a good thing.) I’ve seen a lot of people mention the author being in the JDSF and talk about his OBVIOUS extreme bias, but I do not see it, at least in the anime. I googled the author and the ONLY information I could find was that he was in the JDSF and left it before starting the manga. So it seems to me that people are reading this bias into the work. I’m also a little surprised that you find the presence of characters like Lelei, Rory and Itami miraculous. I thought their presence was the entire point of the story. I mean, unless there was that backdrop of the JDSF coming into this fantasy world and changing everything we wouldn’t get to see these characters acting and interacting the way they do. Itami would still be in Japan going to Doujin shows in between doing just enough to get by in the JDSF and no more instead of being able to make a difference. Lelei would still be learning bits and pieces of knowledge from her lecherous teacher, her latent curiosity not given enough room to spread its wings. Rory would probably be bored in a world where nothing and no one approaches being her equal in power. Pina wouldn’t have had this opportunity to prove her worth as a commander and leader. And so on. Characters have to be placed in a disagreeable situation in order to come into conflict with something that will spur on their growth. In this anime, that situation is the JDSF entering this fantasy world and shaking up the power dynamics. Saying that this show glorifies imperialism is like saying post-apocalyptic tales glorify world destruction. And I just don’t get where you think the main goal of the show is glorifying the military when most of the material and the povs that comprise the show are about these women learning to grow through their difficult situation or about Itami daring to do the right thing no matter what his orders are. It seems obvious to me that is what the show is really about. 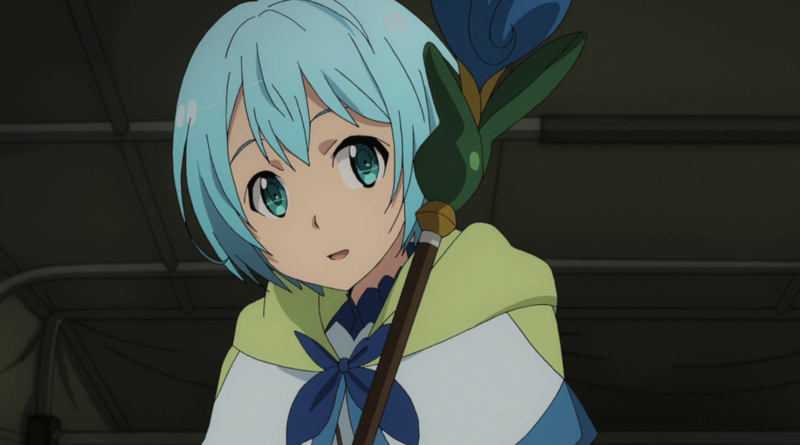 Also, Itami was easily my favorite character. I loved him from the first episode. He’s totally my kinda guy. I think these are all fair thoughts to have—hopefully I’ll do a better job of articulating my position when I publish the more in-depth article. I think a lot of this one actually relies on the reader agreeing with my basic opinions about how the JSDF is portrayed, but if one didn’t agree with that then the rest of the points I made would, as you point out, seem really weird. Also, to be more clear on one particular point…I don’t think GATE glorifies imperialism—I just think it comes from an inherently imperialistic mindset (although maybe colonial would be more appropriate since I think the imperialism is a somewhat unconscious effect). Anyways, like I said, hopefully my longer piece will kind of articulate my points more clearly for you. Thank you for this comment, though. It’s good to know that the second piece was a good idea. Perhaps if you didn’t just present your basic opinions about how the JDSF is portrayed as a given. I think you need to justify that opinion to some extent or at least explain it.